absorbent mind – the first plane of development where the child has the capability to absorb large amounts of information about their environment through their senses. During this plane of development children acquire language, develop motor and cognitive skills, copy the social skills of adults, and learn expectations of how the world will treat them. control of error – a term used to describe self-correction that is built into Montessori materials and teaching methods. conscious absorption – the second plane of development when children are still able to absorb much of the environment around them, but are also beginning to focus inward, becoming aware of the choices they can make, and the desire to do so. conscious mind – when a person is aware and is thinking or acting deliberately, choosing one thought, action, or object over another based on the information he/she gathered from their surrounding environment. 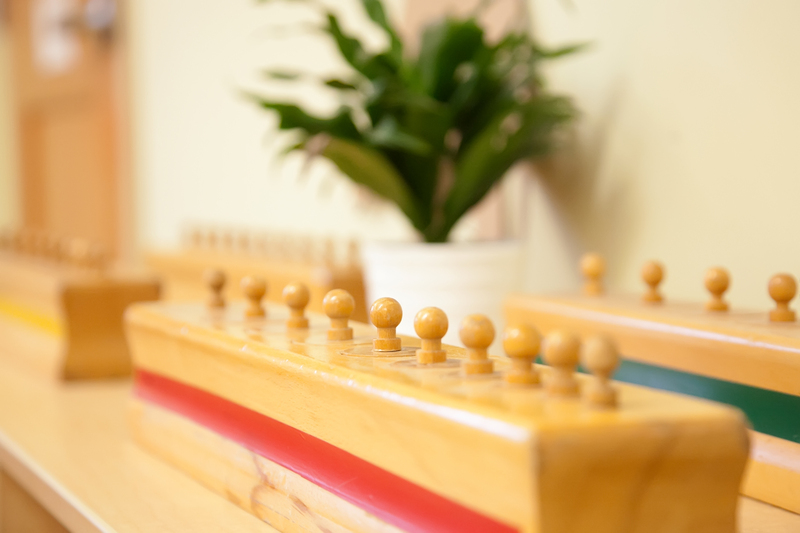 cosmic education – a Montessori approach that develops an awareness in the child that everything in the universe is connects and interdependent, forming a harmonious whole and they are a contributing part to that whole. directed choice – gives a child the opportunity to choose between two equally attractive and positive actions, objects, or activities. four planes of development: – Dr. Montessori saw the human being going through four planes, or stages, of development with each plane having unique characteristics and opportunities for learning. freedom & responsibility -The idea that freedom follows responsible behavior is an important concept in Montessori philosophy. If a child “responds with ability,” then corresponding freedoms are given. For example, if a child remembers to bring their coat, then they will be given the freedom to go outside when it is cold. normalization – a word used to describe when children are able to focus and concentrate for extended periods of time and have a sense of satisfaction about their work. pincer grasp – refers to the thumb-and-forefinger motion that’s involved for manipulating small items. planes of development – refers to the four distinct periods of growth, development, and learning for children and youth (0-6, 6-12, 12-18, and 18-24). The method was designed that at each plane maximum advantage was taken for the benefit of the child. practical life – a series of fine motor skills that include cleaning and caring for the environment as well as preparing food. These activities benefit the child because it develops and prepares the child for fine motor skills that form the basis for writing and cognitive skills. prepared environment – designed so that the child has the maximum ability for learning and exploration. The phrase ‘prepared environment’ refers to a well-thought out environment, classroom or home, designed with the child in mind. The goal of the prepared environment is to foster independence in the child. rightness for the task – the child sees a need in the environment he/she is able to find the right materials to fill and carry out the need without an adult’s intervention. sensitive period – a period of time when children spend much of their time and energy focused on one certain skill or activity. work – a term used to give validation to a child’s play, meaning what some would call “play” is vital to a child’s development and places value on the child’s activities. The “work” concept in Montessori schools is an effort or activity that adds value to the child or environment and is also enjoyable and interesting. work cycle – A basic work cycle begins with choosing an activity, doing that activity, returning the activity to order, and then experiencing a sense of satisfaction. That defines one unit or cycle of work. This sense of satisfaction, which may last a few seconds to a few minutes, helps motivate the child (and adult) to choose the next activity, thus creating another cycle of work…the development of a work cycle is an important component in the idea of normalization for the child.